Silver scurf, caused by the fungus Helminthosporium solani, is a common disease of potato and is present in all major production areas in the United States. The incidence and severity of silver scurf in New York, and its associated economic losses, have increased since about 1985. The brown blemishes that develop on the tuber surface lower the market value of the crop. These losses are greatest when the disease occurs on tubers with white or red skin intended for the table-stock market. The increased water loss from infected tubers during storage results in shrinkage that can be economically significant. Silver scurf-infected tubers may be more susceptible to secondary infection by other pathogens. Silver scurf infection has been associated with decreased seed-tuber vigor, but the importance of these effects is not well documented. Thiabendazole, a fungicide used as a prestorage treatment for control of Fusarium dry rot, has provided nontarget control of silver scurf in storage. Fungicide-resistant isolates of H. solani have been reported in New York and several other states, however, and this may be contributing to the increased incidence of silver scurf. H. solani infects only the periderm (skin) of the potato tuber. Experimental attempts to infect stems, stolons, and roots have not been successful. Tubers are infected during the growing season, and lesions become visible in 3 to 5 weeks. Symptoms usually appear at the stolon end of the tuber as small pale brown spots (fig. 1). Lesions may be difficult to detect at harvest, particularly if the tubers are not washed. Tubers that appear to be disease-free at harvest may develop symptoms in storage. Silver scurf symptoms can be confused with black dot (see Fact Sheet, page: 725.70, Black Dot Disease of Potato). The appearance of silver scurf lesions often changes during the storage period. Severe browning of the surface layers of tubers may occur, followed by sloughing-off of the outer layers of the periderm (fig. 2), so that the tuber is protected only by the inner periderm. Lesions have definite margins and are circular, but individual lesions may coalesce as the disease progresses. The silvery appearance of older lesions, for which the disease is named, is most obvious when the tubers are wet and results from air pockets in dead periderm cells. After some time in storage, the surface of the infected tubers may become shriveled and wrinkled due to excessive water loss from the silver scurf lesions. Cell death, however, never extends beyond the periderm into the tuber flesh. The appearance of lesions also varies with skin type. Brown blemishes are very obvious on red varieties because the red pigment in the tuber skin is destroyed (fig. 3). In contrast, infection of russet-skinned tubers is masked by the dark thick periderm. Russet varieties are susceptible, however, and sporulation on the tuber surface is sometimes apparent. Under conditions favorablefor the disease (relative humidity >90 percent and temperature >4°C), masses of dark conidia are formed on the surface of the tuber (fig. 4). The obclavate, straight, or curved conidiaare arranged inwhorls on the sides of a black, multiseptate conidiophore (fig. 5). Conidia have 2-8 pseudosepta and are attached to the conidiophore from its broad end (fig. 6). H. solani is seedborne and infected seed tubers are probably the main source of inoculum for infection of daughter tubers. The pathogen produces reproductive structures, called conidia, on the surface of the seed tuber. These conidia are washed off the seed tuber and through the soil by rain or irrigation; some of these are deposited near or on the surfaces of the daughter tubers. Conidia germinate in response to free moisture and infect tubers directly through the periderm or through lenticels. The pathogen then colonizes the periderm cells. Infection can occur as soon as tubers are formed and may continue throughout the growing season. H. solani does not infect or grow along roots, stems, or stolons. Research done in Europe and Canada suggests that the soil is not a significant source of overwintering inoculum; survival of spores in the soil is thought to be poor. Experiments in Canada showed that fallowing and treatment of the soil with fungicides prior to planting did not affect disease incidence in a subsequent crop. The importance of overwintering soil inoculum has not been evaluated in this country, but there is circumstantial evidence that the pathogen can survive in the soil for more than one season in New York State. Since H. solani can certainly survive on tubers left in the soil from previous crops, volunteer potatoes can be a source of inoculum for silver scurf and many other diseases. The incidence and severity of silver scurf can increase significantly during storage. Temperature and humidity conditions commonly found in potato storages are favorable for disease spread and symptom development. The fungus sporulates on the surface of infected tubers at high relative humidity (>90 percent) and temperatures of 3°C (38°F) or higher. Conidia carried by air currents in the storage land on healthy tubers where free moisture, caused by fluctuating temperatures at high relative humidity, allows germination of the conidia, infection of tubers, and lesion development and expansion. Disease incidence and severity can increase greatly on tubers stored for a few months. Control practices recommended for silver scurf include: 1) early harvest of tubers, 2) manipulation of storage conditions, 3) use of uninfected seed, 4) control of volunteers, and 5) crop rotation. Early harvest shortens the time daughter tubers are exposed to inoculum and thereby limits disease incidence. The soil environment is often favorable for disease development in late summer and early fall. Late-season infection of mature tubers, even after the vines are dead, can greatly increase the level of silver scurf in the crop. Fluctuation of temperatures, and cold spots that allow moisture condensation or dripping on tubers, will stimulate disease spread in storage. Although the pathogen continues to grow at temperatures as low as 3°C (38°F), disease progress is slow. As storage temperatures rise, disease severity increases. If tubers are kept at a lower relative humidity (<90 percent), spore production and germination are halted, preventing tuber-to-tuber spread. Using clean seed, rotating crops, and controlling volunteers will reduce the amount of initial inoculum, and therefore help to control disease. Unfortunately, it is sometimes difficult to obtain seed that is free of silver scurf. Crop rotation undoubtedly reduces problems with silver scurf, but little is known about the effect of specific rotation crops. Alternate hosts for the fungus have not been reported, and further research is needed. Volunteer potato plants provide a reservoir of inoculum in the field since the pathogen can overwinter in the periderm of the potato tuber. Very little information is available on the relative susceptibility of potato varieties to H. solani. 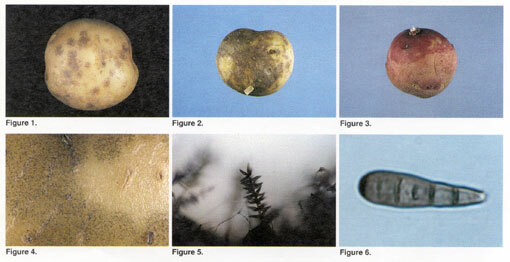 Red potato cultivars have been categorized as susceptible because lesions are very noticeable. Varieties with russet skins are considered resistant because symptoms are not obvious. Current recommendations for potato disease control should be consulted for appropriate fungicide seed treatments and resistant varieties.